My vision suddenly got blurry in both eyes. A 29-year-old woman presented with bilateral blurry vision and headache. Several hours prior to presentation, she noted a progressive decrease in distance vision that limited her ability to read the whiteboard across the room. During this time, she maintained her near vision and was still able to read materials at near and intermediate distances. She subsequently noticed faint halos when looking at bright lights and developed a significant brow ache. The patient denied eye redness, ocular irritation, flashes, floaters, postural changes in visual symptoms, nausea, or vomiting. She began taking topiramate 10 days prior for headaches, and the dose of this medication was doubled the day before onset of symptoms. She also reported developing a skin rash several days after starting topiramate, for which an outside provider prescribed oral prednisone. Gonioscopy: Angular width was 10 degrees OU, and no angle structures were visible in either eye. B-Scan ocular ultrasound was obtained and is shown in Figure 1. Figure 1. B-scan ultrasound, OD. There is a trace choroidal effusion. The left eye had a similar appearance. The patient was instructed to stop topiramate and to follow-up with her primary care doctor regarding alternative treatment options for her systemic medical problems. She was immediately started on timolol 0.25% twice daily, brimonidine 0.2% three times daily, prednisolone acetate 1% four times daily, and cyclopentolate 1% twice daily OU. Following initial therapy, the patient’s intraocular pressure gradually decreased over several hours to 22 mmHg OD and 20 mmHg OS, and she was discharged on the aforementioned medication regimen. The patient’s clinical course is summarized in Table 1. 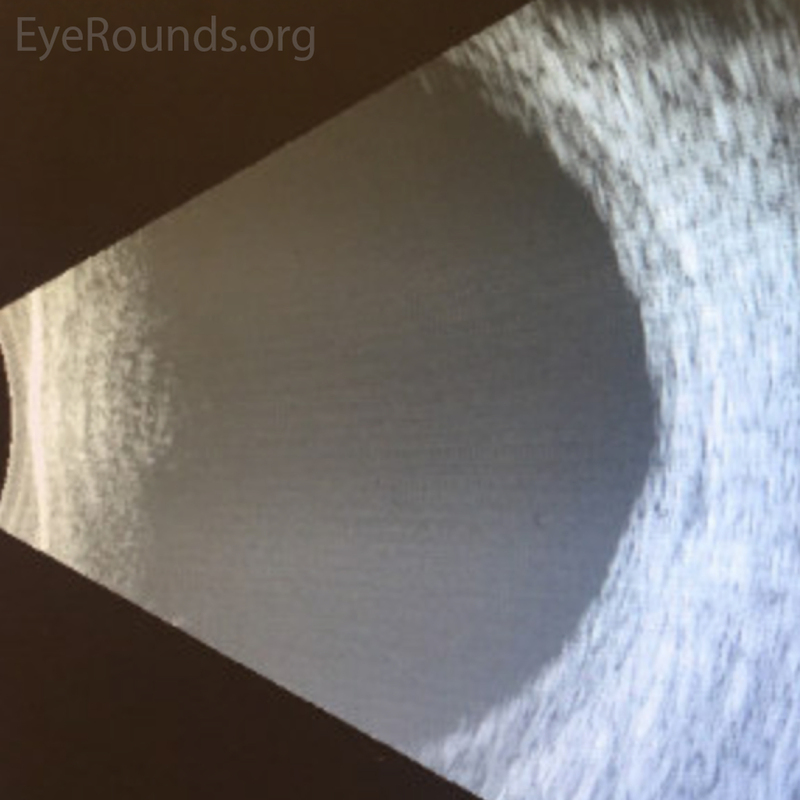 An anterior segment ultrasound was performed at her follow-up two days and two weeks after initial presentation and is shown in Figure 2 and Figure 3, respectively. At the two-week follow-up, her manifest refraction was +0.25 Sphere OD and Plano OS. The patient did not show up for future follow-up appointments. Table 1. Clinical data and medication regimens for Case 1. Figure 2. 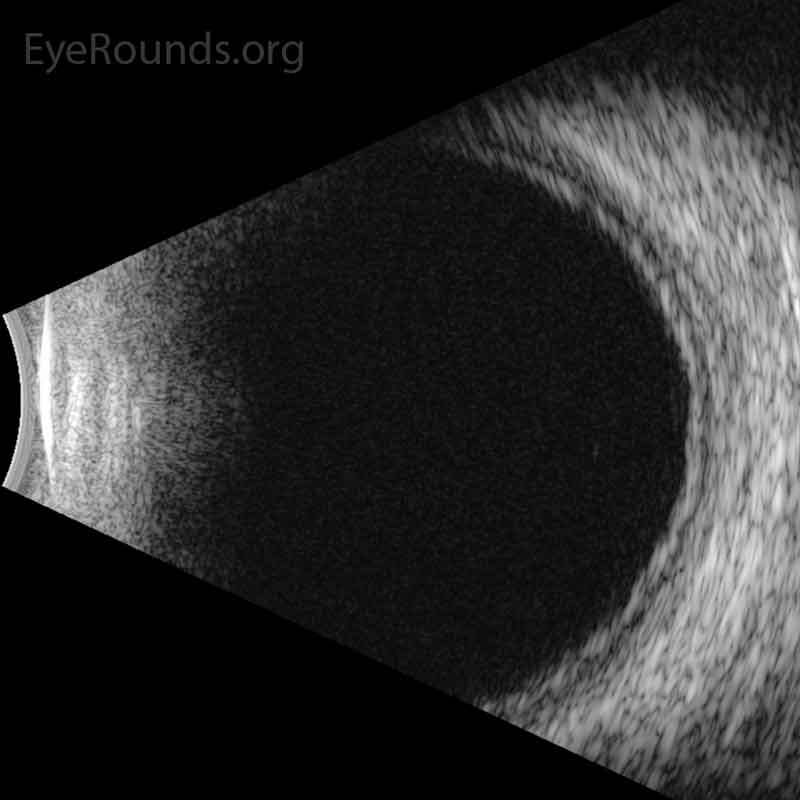 Anterior segment ultrasound of the anterior chamber (A) with attention focused to the ciliary body (B) at two-day follow-up. The anterior chamber is shallow; the angles are narrowed (red angle); the lens-iris diaphragm is displaced forward (red arrow); and the ciliary body is rotated anteriorly (red asterisk). The left eye had a similar appearance. Figure 3. 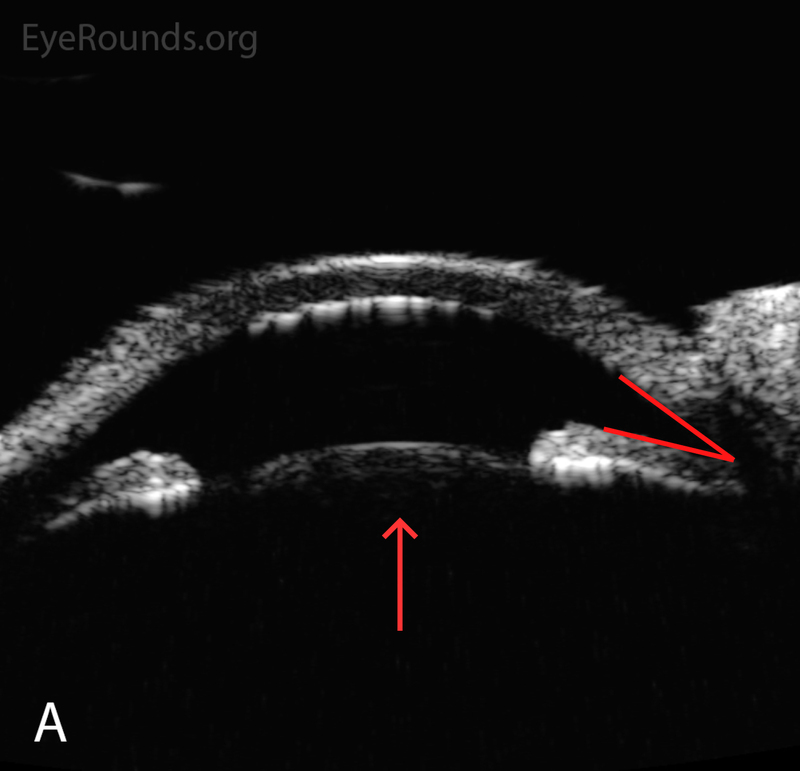 Anterior segment ultrasound of the anterior chamber (A) with attention focused to the ciliary body (B) at two-week follow-up. The anterior chamber is deep; the angle is open (red angle); the lens-iris diaphragm is flat (red arrow); and the ciliary body is no longer rotated anteriorly (red asterisk). The left eye had a similar appearance. I think this medication (holding up topiramate) is making my vision cloudy. A 29-year-old man presented with bilateral blurry vision and headache. The evening prior to presentation, his vision became “cloudy,” and he noted halos around bright lights. Upon waking the next morning, he found that his vision had significantly declined in both eyes. He described sharp eye pain and ocular fullness in both eyes along with a persistent headache. He denied nausea and vomiting. Similar to the patient in Case 1, he began taking topiramate ten days prior, and the dose of this medication was doubled one day prior to the onset of symptoms. Gonioscopy: Angular width was 10 degrees OU and no angle structures were visible in either eye. B-Scan ocular ultrasound was obtained and is shown in Figure 4. Figure 4. B-scan ultrasound, OD. There is a shallow choroidal effusion. The left eye had a similar appearance. The patient was instructed to stop taking topiramate and to follow-up with his primary care doctor regarding alternative treatment for his systemic medical problems. He was started on acetazolamide 500 mg by mouth twice daily along with dorzolamide/timolol 22.3mg/6.8mg per mL twice daily, brimonidine 0.2% three times daily, and cyclopentolate 1% twice daily in both eyes. Following initial therapy, the patient’s intraocular pressure gradually decreased over several hours to the low-20’s in both eyes and he was discharged on the aforementioned medication regimen. At one-day follow-up his acetazolamide was discontinued and his other drops were continued. At his two-week follow-up, all of his medications were discontinued. At four-week follow up, his vision and intraocular pressure were normal off therapy. Topiramate (brand name Topamax) is an anticonvulsant medication commonly prescribed for prophylaxis against migraine and epileptic seizures. More recently, it has been utilized off-label as an effective treatment for various disorders, including alcohol use disorder, binge eating disorder, bulimia nervosa, borderline personality disorder, neuropathic pain, obesity, and idiopathic intracranial hypertension [1-3]. Although this drug can be effective for these conditions, it is important for physicians and patients to recognize the medication’s potential systemic and ophthalmic adverse effects. Well-recognized systemic adverse reactions include paresthesias, cognitive dysfunction, serum electrolyte abnormalities, nephrolithiasis, and osteoporosis. Topiramate-induced angle closure is a rare but serious adverse reaction in which angle closure occurs due to development of ciliochoroidal effusions. This results in anterior rotation of the ciliary body and forward displacement of the lens-iris diaphragm . This condition is an ophthalmic emergency that can potentially result in permanent vision loss if not promptly recognized and appropriately treated. Topiramate-induced angle closure glaucoma is rare. It has been reported to occur in three per 100,000 patients taking the medication . However, numerous cases of this entity have been reported in the literature, and its incidence is anticipated to increase as indications for the drug expand. This condition has been reported to occur more commonly in female patients, but this difference may be explained by the fact that the medication is more commonly used by women . Topiramate is a sulfa-derived anticonvulsant drug that has multiple mechanisms of action, including blockage of carbonic anhydrase, inhibition of sodium channels, enhancement of potassium channels, stimulation of postsynaptic gamma-aminobutyric acid (GABA) receptors, and others . Although the exact mechanism of angle closure remains unknown, this drug is thought to cause accumulation of excess fluid within the choroid and ciliary body due to an increase in permeability of the ciliochoroidal vasculature. 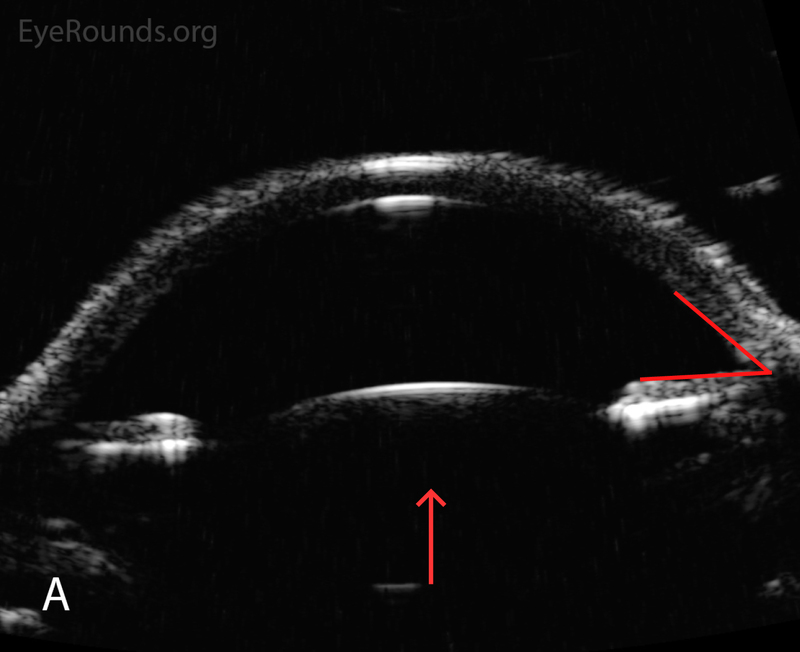 Edema and subsequent thickening of the choroid results in increased retrolenticular pressure, which pushes the iris-lens diaphragm forward . Ciliary body swelling rotates ciliary processes anteriorly, which exacerbates anterior displacement of the iris-lens diaphragm, leading to angle closure. In addition, ciliary body swelling decreases zonular tension, which increases lens thickness. The anterior displacement of the lens and iris leads to the commonly reported myopic shift [6 ,7]. The anatomical alterations that occur in topiramate-induced angle closure are shown in Figure 5. Finally, inflammation may play a role, as multiple cases associated with uveitis have been reported in the literature [8-10]. Furthermore, there are reports of refractory cases in the literature that responded well to high dose steroids . Figure 5. Anatomical alterations in topiramate-induced angle closure. The choroid and ciliary body are depicted in red, the zonules in black, the iris in blue, and the lens and cornea in gray. 5A represents normal ocular anatomy. 5B represents anatomical alterations that occur in this condition. 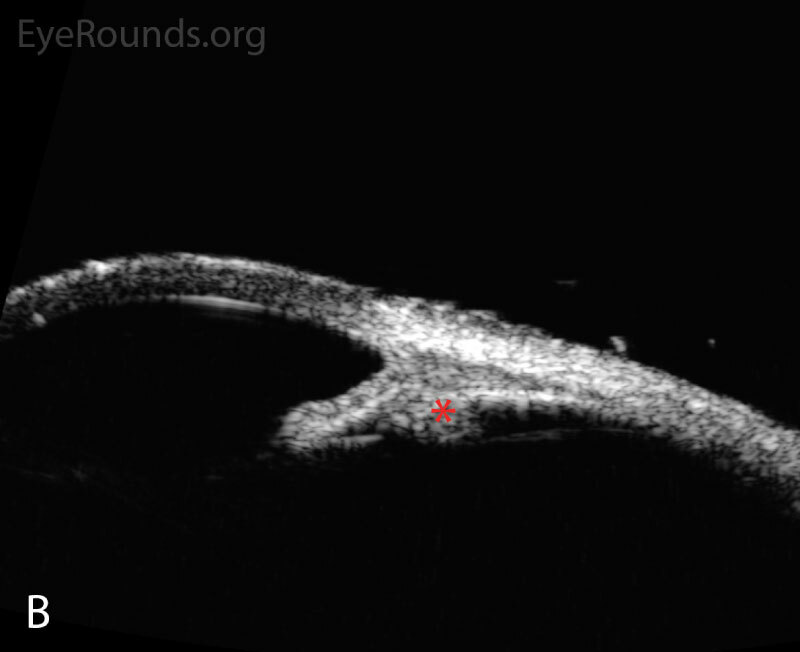 The dashed arrows show ciliochoroidal swelling. The solid arrow indicates anterior displacement of the lens-iris diaphragm, spherical lens changes, and shallowing of the anterior chamber. The classic onset of topiramate-induced angle closure occurs shortly after starting the drug. Reports in the literature suggest that the majority of cases occur within the first two weeks after initiation of treatment or increase in dose . Less commonly, the condition may develop after many months after taking the medication . Topiramate-induced angle closure generally affects both eyes and presents with acute reduced vision, eye pain, eye redness, ocular fullness, headache, and/or nausea and vomiting. In general, these symptoms are less severe than seen in primary angle closure glaucoma (PACG). Blurry vision is worse at distance than near due to the myopic shift, and patients often report halos and glare due to corneal edema from elevated intraocular pressure. Initial evaluation reveals decreased visual acuity and increased intraocular pressure. Typical slit lamp biomicroscopy findings include corneal edema, diffusely shallow anterior chambers, closed angles on gonioscopy, and a mid-dilated pupil without iris bombe. 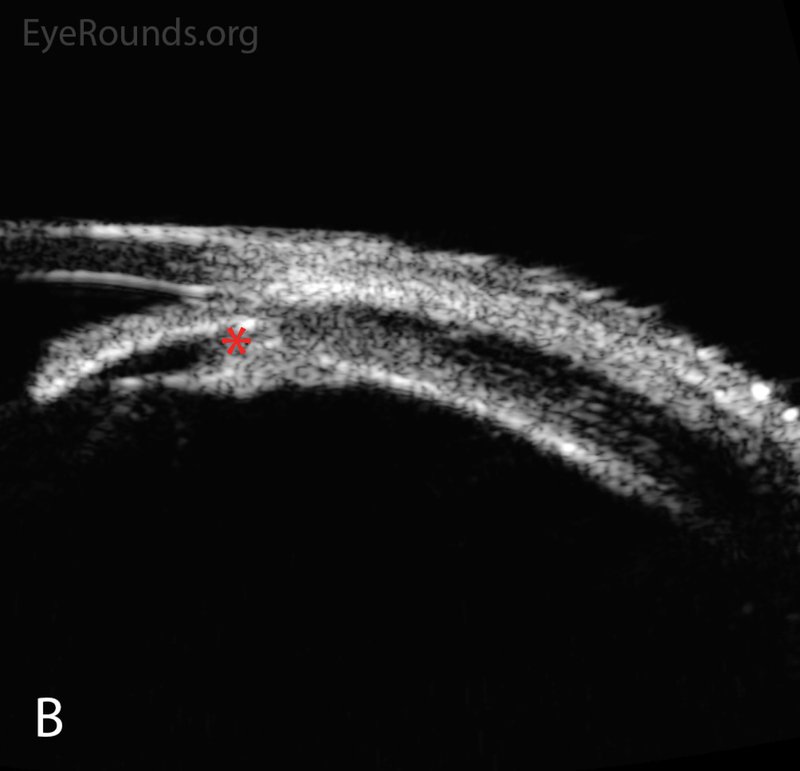 B-scan ultrasonography may reveal ciliochoroidal effusions. The most essential treatment of topiramate-induced angle closure is early recognition and discontinuation of the offending medication. Patients starting this drug should be educated on the symptoms of angle closure and encouraged to see an ophthalmologist urgently should such symptoms occur. The prescribing provider should be notified to allow for alternative management of the condition for which topiramate was prescribed. Management includes topical and/or oral anti-glaucoma medications, a cycloplegic agent such as atropine or cyclopentolate, and topical steroids. Given the underlying pathophysiology of this entity, aqueous suppressants are preferable to other ocular anti-hypertensives, such as prostaglandin analogues or miotics. Prostaglandins should be avoided given their potential inflammatory component and because the uveoscleral outflow system is anatomically blocked in angle closure. Miotics are avoided due to the possibility of pupillary block and further anterior lens-iris diaphragm displacement. Acetazolamide should be used cautiously, as this agent is also a sulfa-derived drug and may exacerbate the problem [13 ,14]. However, there are many reported cases of topiramate-induced angle closure successfully treated with acetazolamide [4 ,15 ,16]. Cycloplegia is critical as paralysis of the ciliary body shifts the lens-iris diaphragm posteriorly and flattens the lens by increasing tension on the lens zonules, effectively opening the angle. Topical steroids may also be important given the suspected inflammatory component of this condition. Systemic steroids may be considered in severe or refractory cases [10 ,17]. There is no role for laser peripheral iridotomy (LPI), since pupillary block is not a component of this condition, but in cases where the diagnosis is unclear, failure of an LPI may be diagnostic in determining a non-pupillary block etiology of angle closure. There are several reports in the literature of successful treatment of topiramate-induced angle closure with choroidal drainage procedures, though we do not recommend this as a first-line therapy . The prognosis of topiramate-induced angle closure is generally good if the medication is stopped early and appropriate treatment is immediately provided. As the ciliochoroidal effusions resolve, the visual acuity, refractive error, intraocular pressure, and anterior chamber usually normalize. In many cases, ocular hypertension resolves within 1-2 days, while visual acuity and refractive error may take 1-2 weeks to return to normal . If the condition is not promptly recognized, sustained elevated intraocular pressure may lead to permanent damage to the optic nerve.